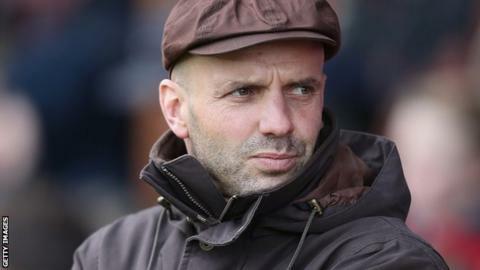 Exeter City manager Paul Tisdale has said the club's "decline has halted" and they are now moving forward again. The League Two side started the season with a transfer embargo but still managed to finish in the top half. "The tone around the club is completely different. The decline has been halted, the pessimism has lifted," Tisdale told BBC Radio Devon. "The job is never easier, it's just different. I'm able to make plans, that's the biggest difference." Exeter received a record £1.75m for England under-20 playmaker Matt Grimes in January. They have already brought in former Brentford midfielder Manny Oyeleke, though City stalwarts Liam Sercombe and Scot Bennett have left St James Park. 27 May: Assistant manager Rob Edwards takes over at Tranmere Rovers. He is not replaced. 3 June: Club forced to take out a loan with the Professional Footballers' Association to cover cashflow problems after lower than predicted crowds. 20 June: Captain Danny Coles is disciplined for abusing a fan on Twitter. He is later sold to Forest Green. 25 July: Chairman Edward Chorlton steps down. 8 August: Chief executive Guy Wolfenden resigns. 15 August: Transfer embargo is lifted. "It's chalk and cheese (from last season). It puts us in a healthy competitive situation," added Tisdale. "This time last year I left the training ground, did my review for a week, locked up and went home. You could call it the worst or the best summer I've had because I literally had nothing to do. "We were going to Brazil on pre-season so I had nothing to arrange, no players to sign, no re-negotiations. It was the quietest, the worst, but bizarrely the most relaxing summer I've had, but now it's gone back to normal." Tisdale has released strikers Graham Cummins and Clinton Morrison and says a new forward is on his shopping list. "I'm looking to bring in one, possibly two strikers. It all comes down to how much the one I want is going to cost me and how much I've got left over. "As per normal I'm looking at every department within the side. I'm always looking for good value and potential."